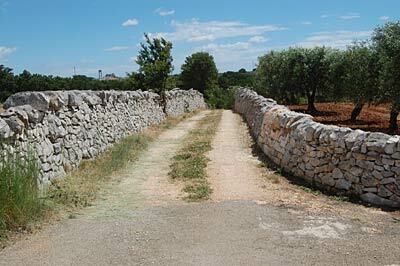 Although the trulli are just five minutes’ drive from Alberobello they are difficult to find the first time as down a narrow country lane that does not have a formal street name. We aim to provide help here, but offer that our agent will meet you at the garage 2 miles away and guide you there first time whenever you arrive. 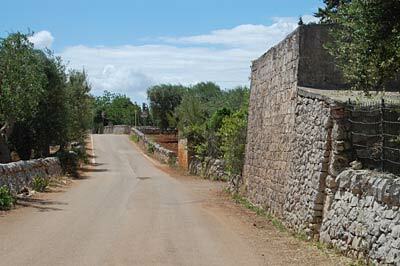 Getting to the trulli is fairly easy except for the final left turn which is from a country road down a narrow track. The left turn is at: 40.7866525, 17.2711864. 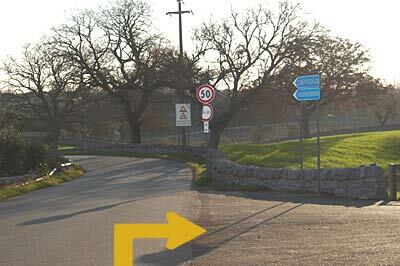 Southern Italian roads are not the easiest to follow, and road sign numbers are infrequent, so here is a very detailed description of how to get to the trulli. From Brindsi Airport the roads to Bari are clearly signposted. From Bari Airport the signs for Brindisi are clearly signposted. From Bari you are heading almost due south. From Brindisi you are heading almost due north. 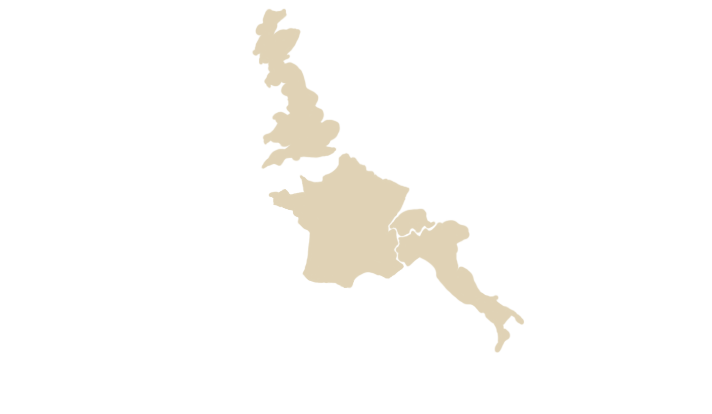 Either way you will end up on the E55 (also known as the SS16), the motorway that runs straight along the Adriatic cost between Bari and Brindisi. Be careful not to get "tempted" by the signs into the centre of either town. 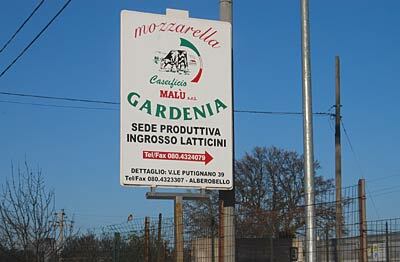 In the case of Bari the ring road will take you through an industrial area around the town, just stick closely to the many signs for Brindisi. 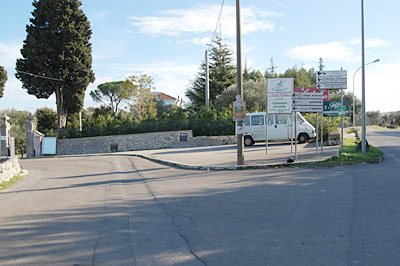 If you are setting off from Brindisi airport, the airport is already to the north of Brindisi, which is the direction you want to go, whereas the town is to the south. 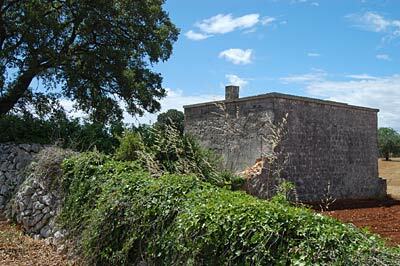 If you are approaching from Bari, the turnoff to Alberobello is 60km from the airport. 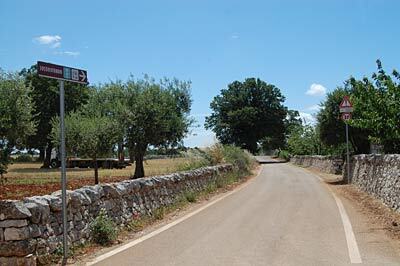 The road to Alberobello from the E55/SS 16 is the SP 113. 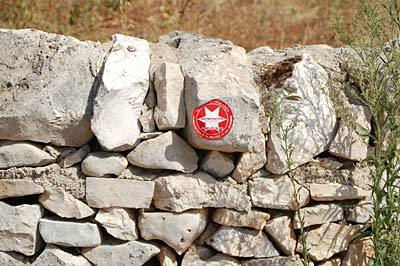 Just keep following the signs for Alberobello. Follow this road for 17.4km. 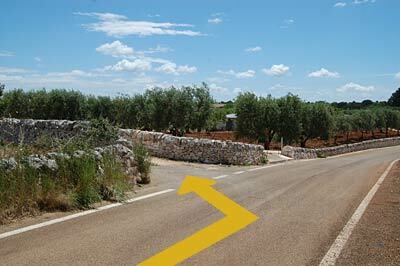 You will then come to a roundabout on the outskirts of Alberobello. 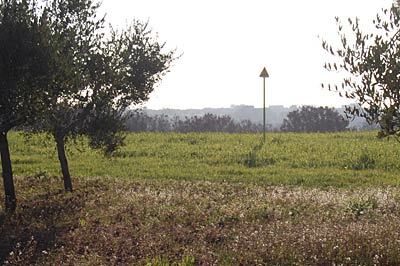 Turn left toward Martina Franca and Locorotondo. This road is known as the Via Einaudi or the Via Gronchi. In the south it is quite common for roads to be known by more than one name. Follow this road for 0.7km, and turn left just past the garage on your left. Left turn as you pass the garage (Approaching from South). As you are turning left after the "IP" garage, you will see this sign on your left. After 1.8km on this road you will come to the first junction with the following signposts Prior to this there will be other turnings, but none with road signposts once you have passed the football stadium. Turn right at these signposts. This road is unsigned, but is the Strada Maccarone. Follow the unmade track down into the dip, ignore the left-hand turning before you have reached the dip. 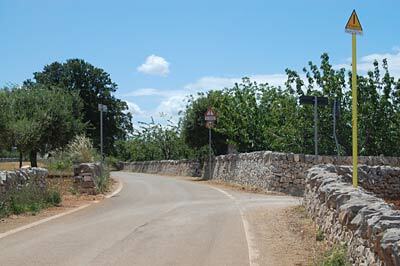 As the road levels off at the bottom of the road, Trullo Alto is the first turning on the left, through the first set of iron gates, Trullo Olivo is through the second set of gates. If you are arriving at night, outdoor drive lights will be switched on for you. On exiting the airport follow signs for AUTOSTRADE direction BARI. After about 5km you will come to a toll booth to access the A16 motorway towards BARI. Take a ticket at the toll booth. Avoid the toll booths signed "Telepass" - these are for Telepass members only. The ticket is paid when you exit the autostrada. To pay in cash, head for the channels marked with a hand paying in cash. Major credit cards are accepted at the channels displaying "Via Card". After 173km the motorway will become the A14. Keep following direction BARI. After a further 75km you will come to the exit Bari Nord. At Bari Nord exit the motorway and pay the toll (approx €15) and follow directions for BARI /BRINDISI/ LECCE onto the SS16. After approx 50km take the exit signed MONOPOLI – ALBEROBELLO (Do not take any of the earlier exits signed for Monopoli). Follow the Brindsi / Bari instructions above from the third paragraph. On exiting Fiumicino Airport follow signs for the "GRA (Grand Raccordo Anulare) and AUTOSTRADE"
Follow signs for the A1 direction NAPOLI. 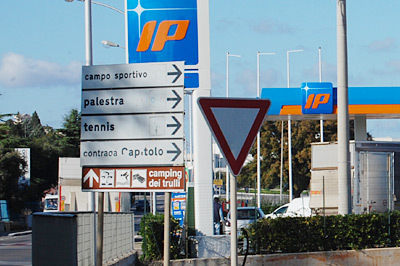 About 20km from the airport you will need to take a toll ticket to access the A1 NAPOLI. Avoid the toll booths signed "Telepass" – these are for Telepass members only. The ticket is paid when you exit the autostrada. To pay in cash, head for the channels marked with a hand paying in cash. Major credit cards are accepted at the channels displaying "Via Card"